There will be not one, but two swimming pools. There will be six basketball courts. There will be six volleyball courts, a fitness center and indoor running track with views of most of the facilities. And there is space to expand. In fact, according to the consultants addressing Bridgeport City Council this evening there is plenty of room and plenty of planning already done for what could be – once everything is set – up to a $50 million dollar project. “We’re making this a destination to the region,” said Jim Christie, with Civil Environment Consultants (CEC), part of the consultant group led by Fairmont’s Omni Associates. It’s likely the courts and the pool area, particularly what they’re calling the natatorium, will be that draw. The courts will allow for the city to host basketball and volleyball tournaments and a number of other events. The two pools, one of which is a competitive 25 meter pool with eight lanes (and with the possibility to be 10 lanes according to one of the consultants) is another destination draw. 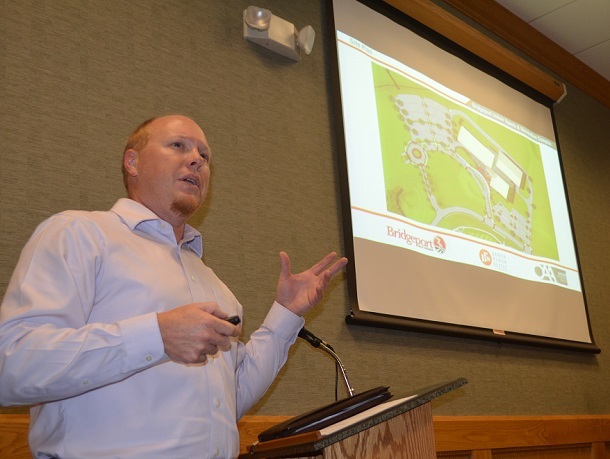 Richard Forren of Omni said there is seating for 600-plus individuals in the competitive pool area that includes permanent seating and seating that can be added. There will also be an indoor “community pool.” That pool will be heated and allow for not only recreational use, but for other community and exercise-related programs. The building on the site, which is the only component that right now is going to be built, will also be user friendly. The roadways are set up for easy access in and out and designed to be pedestrian friendly. It will be ADA compliant and eventually have a cafeteria inside. Officials also said it will be staffed by up to 120 people and have an operating budget annually in excess of $1 million. “It’s a big building, but when you come into it you’re not going to feel lost,” said Kevin Armstrong of brs Architects. 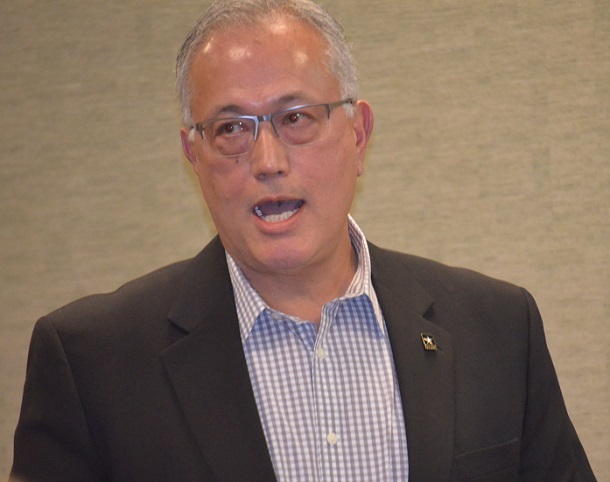 Bridgeport Mayor Andy Lang cautioned everyone that schematic drawings that have been released publicly are for the proposed entire buildout. He said as of now, the other components beyond the massive 156,000 square foot building aren’t definitive. Planning for the future, though, does include some unique items. Christie pointed out the future could see four multi-purpose fields, an amphitheater with 2,000 seats and a stadium behind the main building. The building is funded by the 1 percent sales tax the City of Bridgeport instituted under Home Rule. It began in July of 2016. While earth work is already under way, the bidding for the construction of the project is anticipated to take place in the first quarter of 2019. City Manager Kim Haws estimated the opening of the facility to be in 2020. One other item of length came up during the “public comments” portion of the meeting. Former Bridgeport Police Lt. Mike Lemley addressed Council on reasons he left his position after 20-plus years. Lemley discussed the disappearance of a “family atmosphere” at the city during his time. He also voiced dismay over pay and step pay increases, particularly going from officer to sergeant. Lemley said meetings were held with city administration over that issue and also regarding compensation due to “experienced officers” leaving the city. 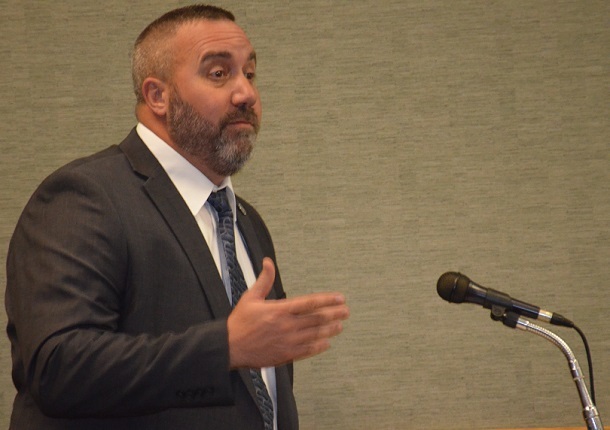 While Lemley voiced concerns over issues (not all listed here such as not receiving items he believes state code calls for him receiving after 20 years of service), he also voiced concerns for the officers he used to have under his supervision. In particular, he asked Council to provide more compensation for officers above the 5 percent raises recently provided. Following the meeting City Manager Kim Haws could not comment on the matter. As has been the case for all personnel matter, the city cannot go on public record to discuss to talk to any personnel issues. Recognized elementary students here were among more than 100 that submitted entries for the city’s 2019 calendar. Those on hand were among the 13 chosen to be included after submissions during Bridgeport Municipal Government week. Check back later for photos featuring the winners. Reappointed Fred Sartoris, Bridget Furbee and John Stogran to the Bridgeport Development Authority. The terms are for three years. Reappointed Jolie Carter to the Bridgeport Planning Commission for a term of three years. Saw Christopher “Bart” Sayers sworn in as a sergeant and James “Jimmy” Petroski as a Lieutenant for the Bridgeport Police Department. More on that later on Connect-Bridgeport. Consider and approved a new member to the Bridgeport Emergency Services Council in Dr. Sidney Jackson. Editor's Note: Top photo shows CEC's Jim Christie addressing the audience, while Bridgeport Mayor Andy Lang is shown during the work session. Third photo shows Richard Forren of Omni Architects, while former Police Lt. Mike Lemley is shown below.